For two hundred years local historians have studied and rejoiced in the outsize tomes of John Nichols’ remarkable History of Leicestershire (1795-1815), assimilating and recording its huge volume of information on the county’s history. They have learnt about Leicestershire’s churches, architecture, archaeology, heraldry, land rights, genealogy and antiquities, but have also delighted in Nichols’ fine engravings of country houses and portraits, and enjoyed his spicy anecdotes, bizarre facts, multitudinous footnotes and engaging sense of humour. So a new full colour publication soon to be launched by the Leicestershire Archaeological & Historical Society, entitled Nichols’ History of Leicestershire: a bi-centenary celebration 2015, is a timely and appropriate addition to the county’s literature in this significant Nichols bi-centenary year. 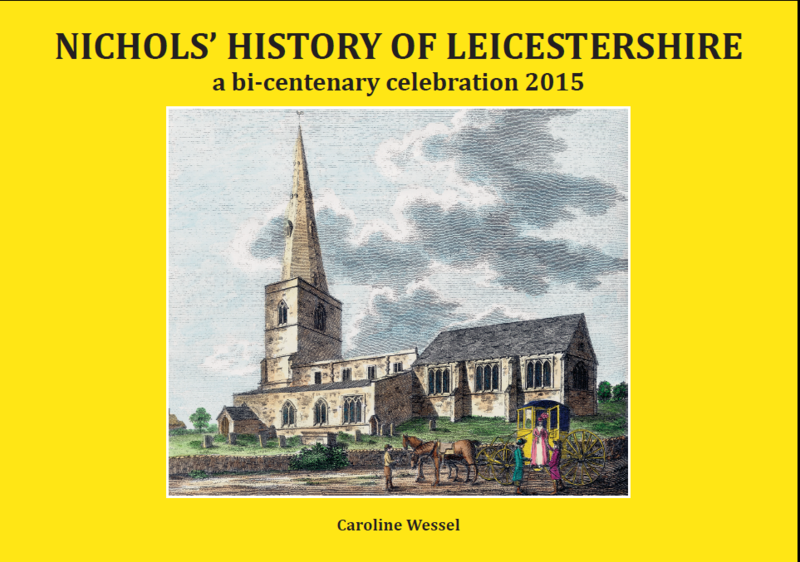 The publication, compiled and written by LAHS Vice Chairman Caroline Wessel, explores and celebrates the remarkable lives, talents and achievements of three generations of the Nichols family and the literary and antiquarian world of London and Leicestershire they inhabited. Focussing on the extensive and varied contents of Nichols’ History, a veritable treasure trove of information is uncovered. The ‘User’s Guide’ and ‘Who’s Who’ chapters are invaluable tools for the Nichols researcher, whilst a chapter by Leicestershire archivist, Robin Jenkins, and contributions from present-day Leicestershire people with specialist expertise, bring John Nichols’ concept of enlisting the local populace right up to date. Two further chapters of the book are written by Julian Pooley, Surrey archivist and Nichols enthusiast, whose online Nichols Archive Project calendars around 14,000 Nichols family letters and journals, shedding light upon late eighteenth- and early nineteenth-century daily life. Another exciting feature is the inclusion of some original watercolours, engravings and sketches taken from the volumes of John Nichols’ own copy of his Leicestershire History. He and his family spliced hundreds of additional pages of fascinating material into his personal copy- a miscellany of paintings, drawings, manuscripts, pamphlets, maps, letters, handwritten notes, pedigrees, autographs and newspaper cuttings. So it is a delight to find a celebration of Nichols’ own private collection within the pages of this bi-centenary publication. This highly readable new book, with its evocative illustrations and gentle humour, is a must for historians and for all those who love Leicestershire. Price £9.95 or, if by post, £11.75 including postage/packing. This page was added on 17/12/2014.